Nearby Via di San Francesco di Paola. Florence: Public Art (by Private Initiative). The street, alas, is too narrow for us to squeeze them both into the same frame. But the two Biancanevi (Snow Whites, to you) could pretty nearly reach out and wring each other's neck. One house has the year-round yellow tulips (certainly a nice touch), but seems a dwarf or two short of a full deck. Still, passions run high... And what happens in Via D******* B********* stays in Via D******* B*********. Speaking as a friend, I wouldn't advise you to get involved. with its famous dwarves on the garden wall. This was so much fun. Thanks for sharing your find. Just when I thought your blogs couldn't possibly be more witty, or deliciously humorous....you did it again!! I can't decide which post is my most favorite...but this is getting high marks....what is up with the poor dwarfs chubby ankles being chained down? The dwarfs must be in high demand, for black market distribution? What a smashing blog, lovely photos, I'm totally jealous! Thanks! And isn't that your namesake up at the top of the post? (I am afraid that my dwarfology isn't all that it might be.) I, too, am in perpetual awe of my brother's photos. I just hope that he never wises up and moves on to bigger and better things! What a delightful and amusing bog, and with a historical "sting in the tail". 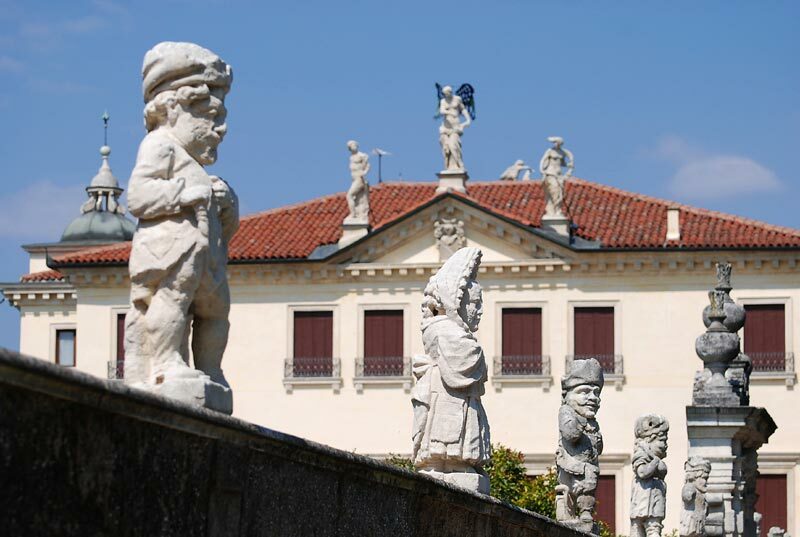 The photos are beautiful, and I love the way you loop back to the dwarves on the wall of Villa Valmerana ai Nani — brilliant. Truth be told: It was August and more or less everyone in Via D******* B********* was away on holiday. My brother and I drove up with a load of dwarves in the back of a van, spotted two likely houses, set up the photo op. And then we were out of there—with no one the wiser.